Today’s children don’t know a world without smartphones and the internet. They are growing up in an age where entertainment and information is always at the tip of their fingers. It is no surprise, then, that they spend a considerable amount of their time with technology each day. Television still remains the media of choice among young children, with kids aged 5 to 8 spending around 64 minutes watching television each day, a number which is even higher in the 2 to 4 year old age group. Nearly 40 percent of parents report that their child owns a smartphone, and significant percentages have access to television in their rooms. Seventy-six percent of parents at least somewhat agree that the less time kids spend with screen media, the better off they are, but this belief doesn’t seem to be greatly affecting the amount of media parents allow their kids to consume. The viewing habits of teenagers are somewhat different than those of younger children; an increasing number of teens are watching their television online, through the use of a subscription video-on-demand service such as Netflix. In the fall of 2018, 38 percent of teenagers’ daily video content was consumed via Netflix, and a further 33 percent through YouTube, illustrating the changing face of traditional television. Despite the growing success of on-demand streaming, kids don’t seem to have lost interest in theatre films. Over 216 million tickets were sold for kids fiction movies in North America last year, with the Incredibles 2 grossing over 600 million dollars in the North American box office. Internet usage, social media, and online gaming have also become significant aspects of the lives of children. North American teens and young adults spend an average of 170 minutes per day using social media, meaning that it takes up a significant portion of their free time. Gaming will always remain popular with children and, with the increasing prevalence of smartphones among young people, the mobile game industry is larger than ever. In addition to the various digital entertainment sources, reading remains popular as a more traditional source of media and entertainment among children in the United States. As of 2017, 31 percent of parents stated that their child reads or is read to several times per day. Youth magazines such as Scholastic News, Teen VOGUE, and FamilyFun all have circulation numbers in the millions, and children’s books frequently sell hundreds of thousands of copies. With the growing media and entertainment possibilities available to children, it is becoming more and more important for parents to monitor the content that their children have access to and take measures to limit their exposure to things that aren’t age-appropriate. 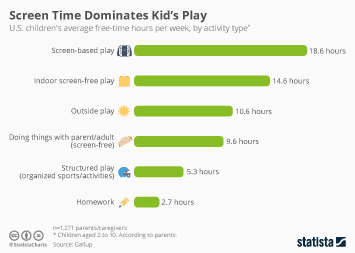 Around 94 percent of parents state that they pay attention to the content of the games their children play, and a large majority place time limits on gaming, internet usage, and television usage. Parental controls are becoming more and more sophisticated, and can be helpful in automatically filtering or alerting parents of sensitive media. Overall, may parents believe that media sources can be helpful to their children in certain ways, such as encouraging learning and creativity and helping with their ability to focus. The key, as always, is to strike the balance between taking advantage of the opportunities provided by media, while also being careful to implement a healthy amount of control over the types of content that children have access to. Share of children who own smartphones in the U.S.
Weekly time spent watching TV among 12-17 year-olds in the U.S.